Experimente as águas quentes e relaxantes das fontes termais de Furnas nesta excursão guiada de meio dia. Viaje com um grupo pequeno em uma confortável minivan climatizada. Aproveite as vistas panorâmicas da cratera vulcânica de Furnas e mergulhe nos banhos termais de Poça da Dona Beija. Desfrute de um jantar em um restaurante local juntamente com o conveniente embarque e desembarque no hotel neste agradável e econômico passeio. 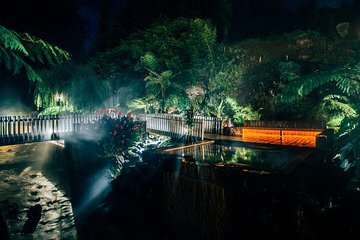 Wonderful dinner, the hot springs were beautiful. Our tour guide was very informative. We had a great time. We will definitely come back. Thermal baths were very nice, the guide gave us tips to make our tour more enjoyable. The food was plentiful, we had a great time! Paulo was a fun guide who had a good mix of humor and knowledge. We went to a small restaurant in Furnas for dinner, followed up with the thermal baths. The baths! OMG THE BATHS!!!! Absolutely wonderful! If I had these within an hour of me I would be there every day! This was the perfect antidote following a day of travel on the airplane and 4 1/2 hours walking around Ponta Delgada in the morning.